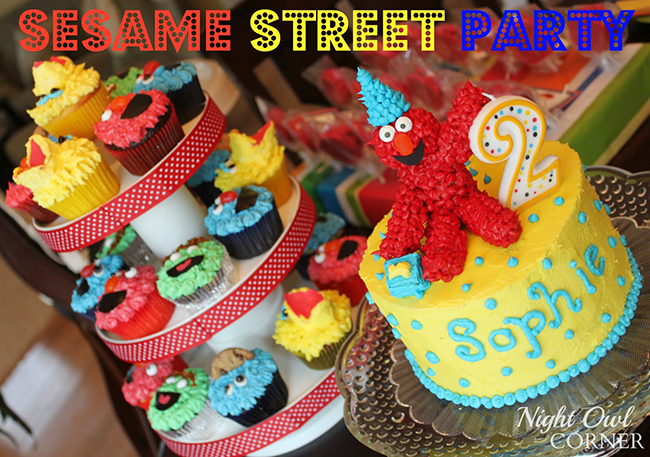 Sesame Street party: Sophie is 2! 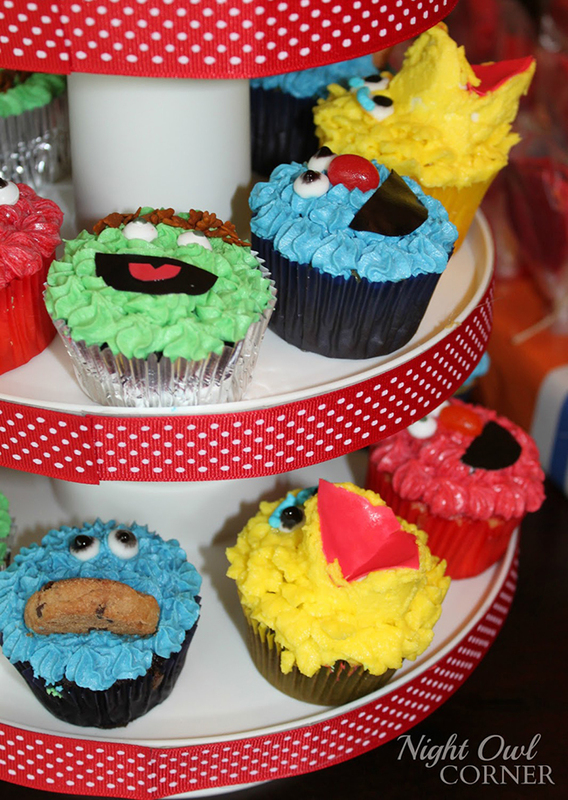 The adorable Sesame Street cake and cupcakes were homemade. 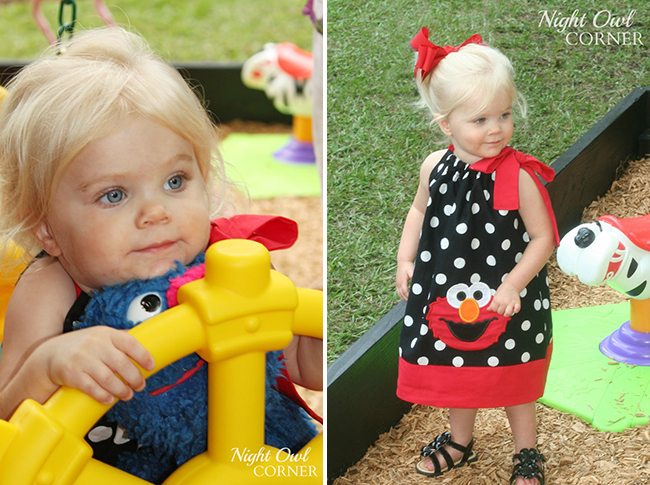 All 6 character pom poms are handmade – Cookie Monster, Big Bird, Oscar the Grouch, Zoe, Elmo, and Grover. Linda used this tutorial to make the poms and drew the facial features herself using a Sesame Street coloring book for inspiration. She cut them out with construction paper and then attached them to the poms with pipe cleaners. She glued the faces on one end of the pipe cleaner and then wrapped the other end around the center of the pom. Linda hung each pom pom using two pieces of fishing line. The first piece was attached at the center and was used for hanging. A second piece was attached under the mouth to keep the face from drooping forward. There were several activity stations, each inspired by a different Sesame Street character, so the kids had plenty to keep them busy! Sophie’s easel became the “Bert and Ernie Chalk Station.” Kids practiced their counting skills at the “Count with The Count” station where they counted goldfish, cookies, ice cream cones, and other fun things and then lifted a flap to discover the correct answer. 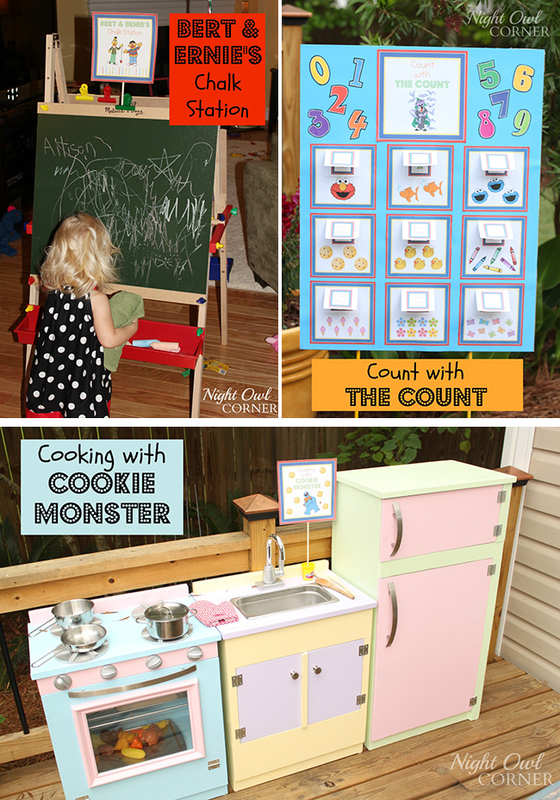 Sophie’s play kitchen became “Cooking with Cookie Monster.” You can learn more about how the play kitchen was made here. More fun stations! Kids could blow bubbles with Big Bird, draw at “Elmo’s Crayon Station” or sculpt play-doh at “Grover’s Play-Doh Station.” Then could play “Oscar’s Trash Toss” by throwing away balled-up newspapers. 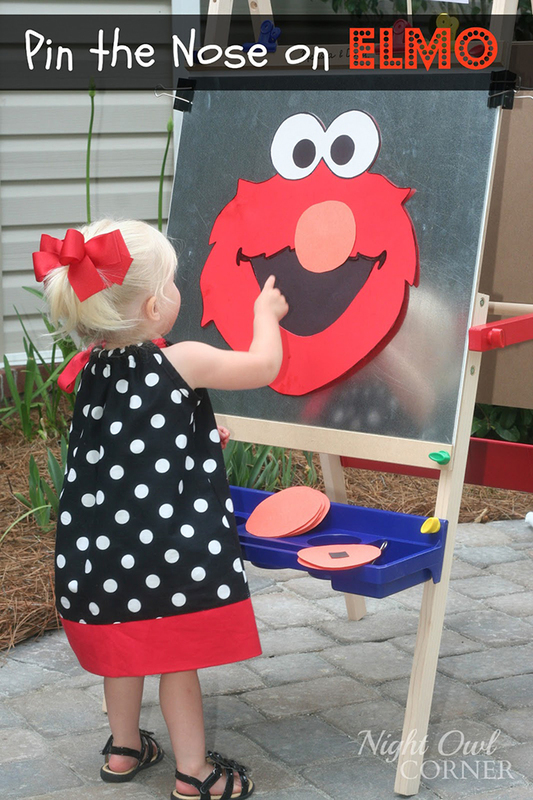 This “Pin the Nose On Elmo” game was handmade by clipping a large sheet of aluminum to an easel and then glueing magnets to the back of the red circle noses. 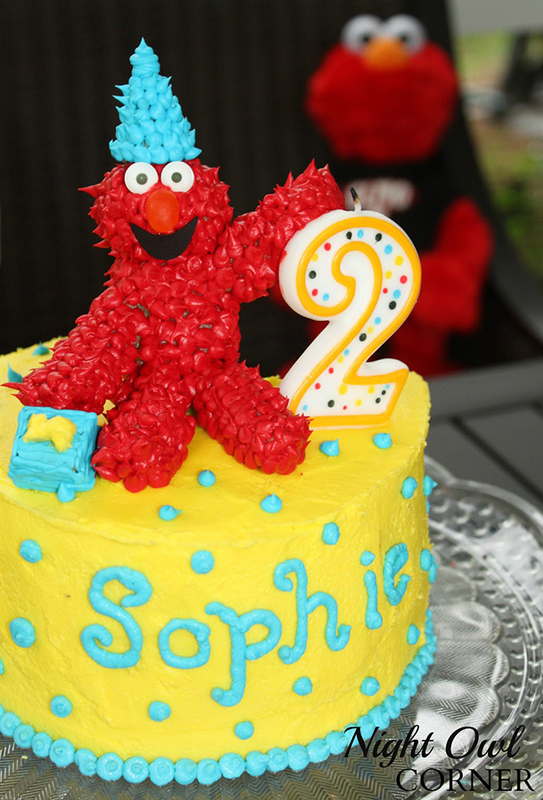 Sophie has an egg allergy so Linda whipped up this great egg-free cake with a Rice Krispie treat Elmo on top! You can get the egg-free cake recipe here. 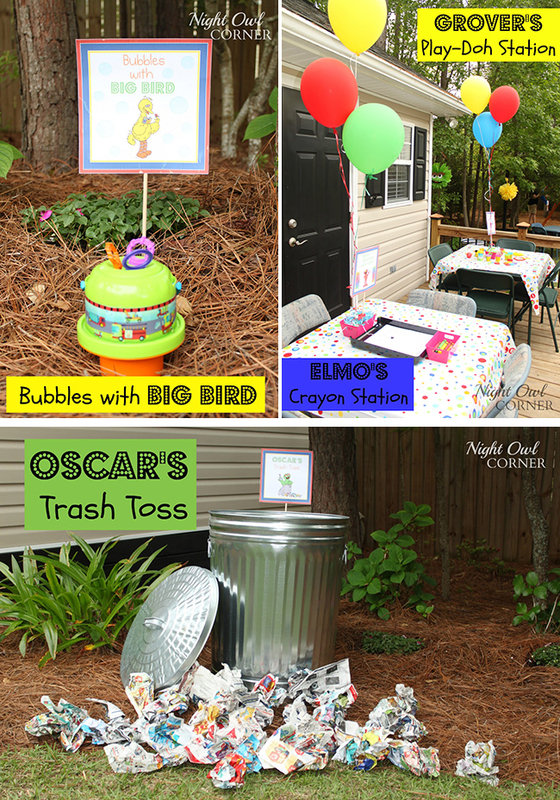 Shop for personalized Sesame Street theme party paper goods and printables here. 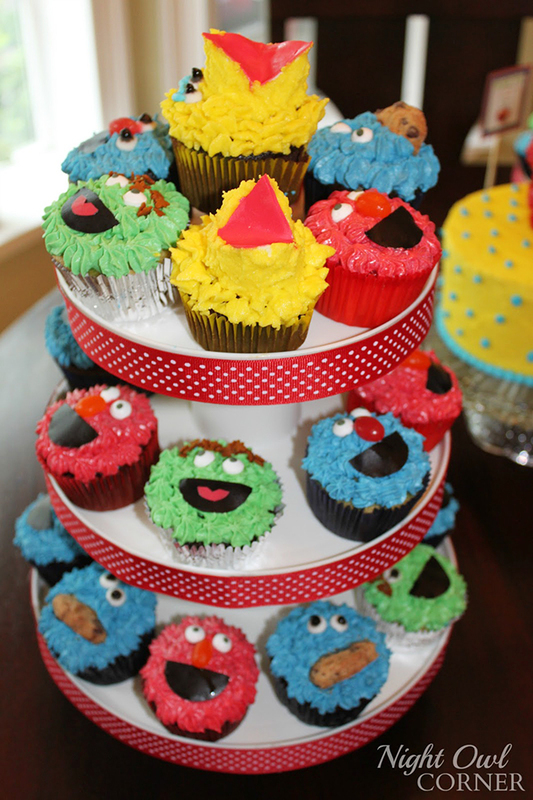 Or, check out more Sesame Street theme party ideas on Pinterest or here on my blog! I am so honored to have my party featured on your site! Thank you! Probably a dumb question but how exactly do you play pin the nose on Elmo? Does each kid get a nose and they tape it on blindfolded? The closest one wins? What if I don't want to do prizes? Is there a fun alternative to winning a prize?